Sending out a lot of emails? Maybe you are a blogger with a growing mailing list or a school administrator that needs to send out emails to parents. Hopefully, you are not sending all of your emails out manually! If you are new to sending mass emails, you may be looking for a solution to automate your process. There are many email merge options—too many to count. But, not all of them are made equal! Today we are breaking down how to use one of the leading email merge add-ons for Google Sheets. Google add-ons are 3rd party tools that you can access from within your spreadsheets to supercharge the way you work. There are hundreds of add-ons available to use for a variety of purposes. Some add-ons allow you to automate simple tasks, saving time and reducing errors that can be created by manual work. Other add-ons are more complicated and can integrate with SaaS tools or help you analyze and report on data. Add-ons can be free or subscription based. They are easy to get, and usually, designed to be pretty intuitive to start using. A mail merge is a feature within an email or spreadsheet program, that allows users to automate the sending of bulk email. With basic mail merge programs, you can send out mass emails and documents to your mail list. 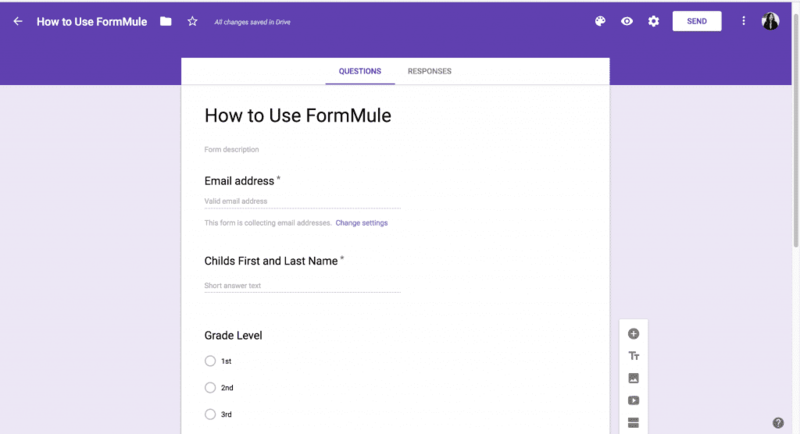 With more advanced mail merge tools, like FormMule, you can send out highly personalized bulk emails to users based on information they provide through Google Forms. 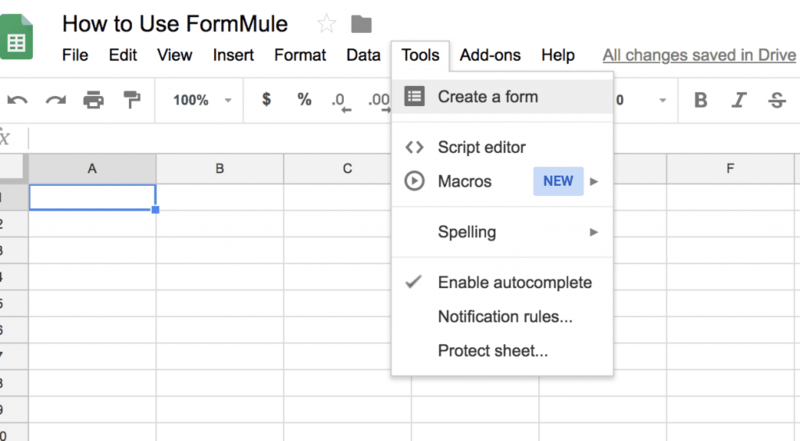 FormMule is an add-on for Google Sheets and a super versatile mail merge tool. You can create complex conditions for how your emails are sent, customize what, when, and to who, based on custom conditions. You can set up FormMule to send out emails on a schedule from a spreadsheet, or based on form submissions. FormMule is one of CloudLab’s awesome add-ons, they create e-tools to change the way that schools operate in the digital space. This add-on was designed with educators in mind but is a valuable tool for anyone who wants to automate administrative tasks or build systems for information distribution. FormMule provides great resources for teachers, school administrators, and Google Apps for Education domain managers. Even if you are not in education, some of these resources might help you come up with solutions for your own mailing processes. 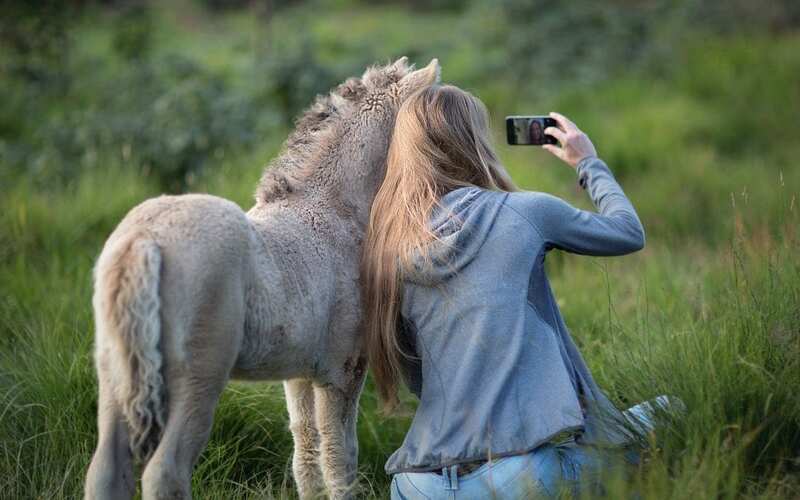 Type “FormMule” in the search box. You are ready to start using FormMule! Now that you have the add-on attached to your Google account, it is time to create your first mail merge. There are a lot of options with FormMule that you can select to customize and personalize your emails. You can even have up to 15 different templates based on certain conditions. Today, let’s imagine that you are providing sign up information for sports teams in your elementary school. We are going to set up a form that will allow parents to sign their kids up for sports. Then, we will set the condition so that they automatically receive an informational email. We will also keep our data available in our spreadsheet so that later in the school year we can send out automatic updates to families based on the information they initially provided! 2. Create the conditions from within Forms. For this tutorial, I am keeping it simple. We will require that parents submit an email address, child’s first and last name, grade level, and choose a sports club. 3. Now we have our first response! Let’s send the student an email about her after school activity! 4. Click Add-ons → FormMule email merge utility → Open and the add-on will open within your sheet. 5. Follow the steps in the FormMule setup manager to create the mail merge. We will choose our form as the source, and trigger the merge to send an email whenever a form response is submitted. This way, parents get an informational email as soon as they request one! We can use this form to create multiple mail merges. Later, we can duplicate this data and create automated emails that go out on a specific schedule. 6. 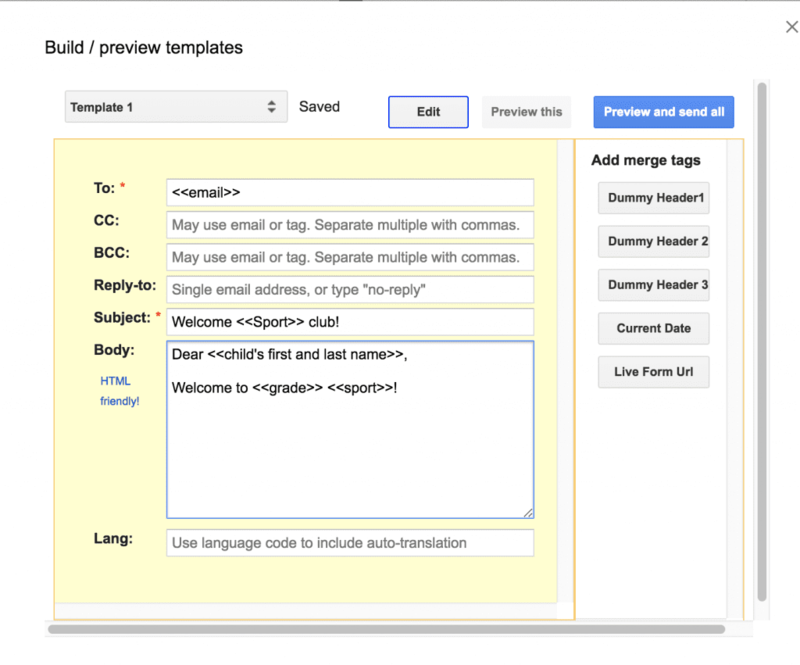 After you set up your send conditions, it is time to create email templates. We have written an introductory email using tags to personalize the email for each child. We can create a template for each sports club! 7. This will likely be the most time-consuming part of your set-up. You will need to draft and preview each template to make sure the emails you send out are accurate and high quality. However, after you set up your templates, you can forget all about them and let FormMule do all of the work from now on!